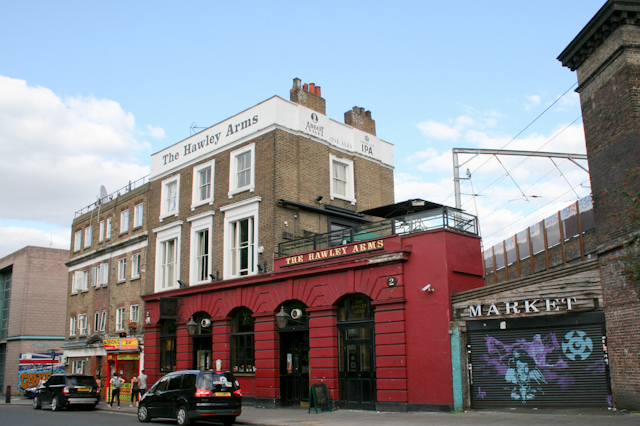 In almost all cases of this Areas of London series, we’ll present to you some of the places to eat, drink, shop and make merry as a walking tour through to the area. 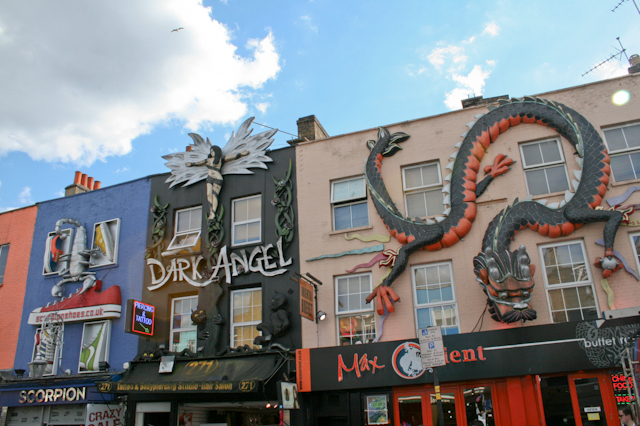 So, let’s crack on and begin with visiting Camden, then…shall we? 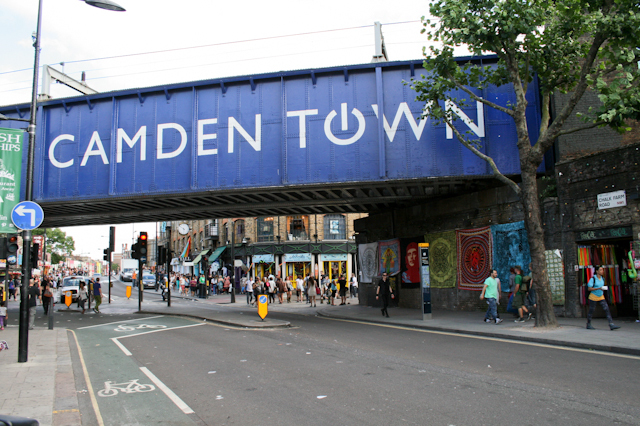 Now, I’ve actually done a bit of a topsy turvy tour of Camden, because I started at Chalk Farm Underground station and walked down to the area around Camden Town Underground station – a complete reverse route of what most visitors do. But bear with me, there’s method to my madness. Over on the left you’ll see a number of eateries, pubs and bars of assorted degrees of quality. Notably, there’s Joe’s for an old school rock ‘n’ roll vibe (it only opens at 5pm each day, so come back later for this one! ); Belgo’s for Belgian beer and food (think frites and mussels) – they often have some very good value deals on; the famous live music venue Barfly and The Lock Tavern for drinks in a rather trendy setting – or upstairs on the first floor terrace if you want to catch some rays. Just a bit further south, you’ll encounter the first of the many markets in Camden, which practically seem to roll into one. 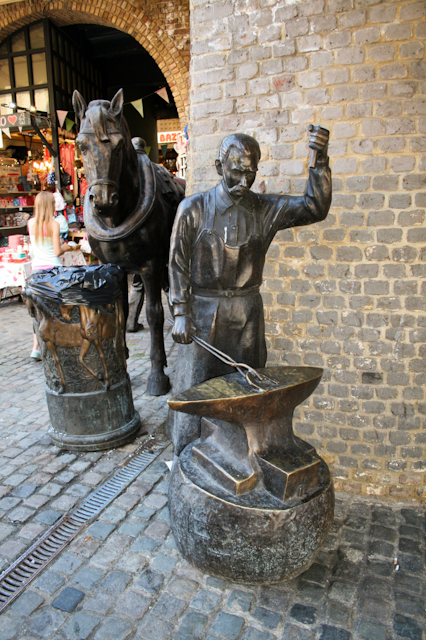 Camden Stables Market exists on the site of a former stables and horse hospital – no surprise there – meaning there’s a number of horse and blacksmith statues dotted around. There’s a insane variety of clothing stalls, accessories and knick knacks; I can’t say this is my favourite market (read on below for that) but given the choice on offer it’s certainly worth a look. The Stables Market is also home to a number of fast food stands, and whilst some of the food looks…shall we say…dubious?…it’s undeniably cheap. Late-night venue Proud Camden is located here, and there’s also a smattering of cheep and cheerful open air bars. 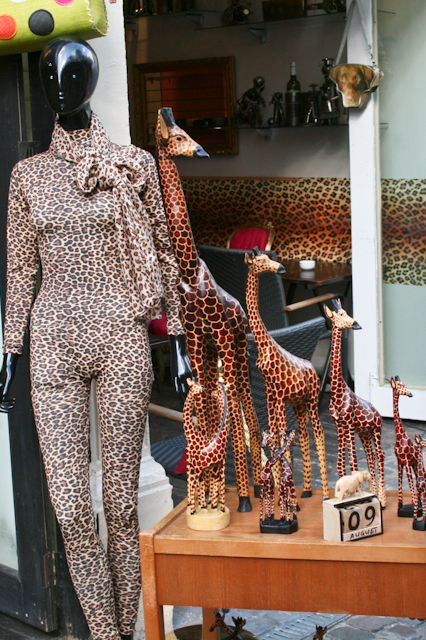 Adjacent to the Stables Market is Camden Lock Market…which is my favourite out of all the markets in Camden! Camden Lock Market sits right on the canal and is right by the lock – it’s amazing how these markets get their names, eh? This particular market is my top choice for the items it sells, both clothing/accessory/knick knack-wise, and food-wise. Whilst there’s still some tat – mobile phone accessories, tacky souvenirs, the opportunity to have your name bent out of a bit of a metal (honestly – who needs that in their life?!) 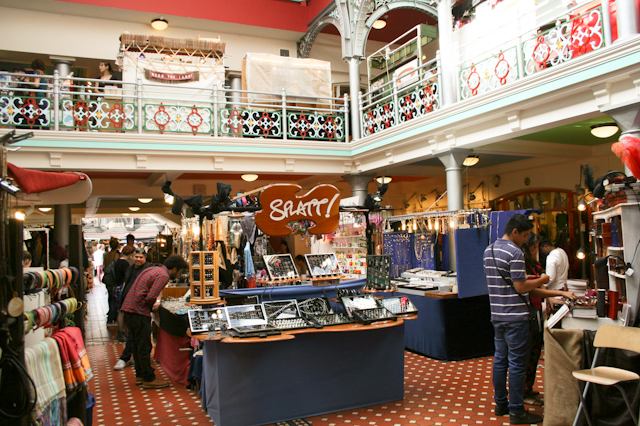 – there’s also a great selection of handcrafted clothes, jewellery, accessories and more, not to mention the ubiquitous record and London poster stalls. When you walk around, it’s not hard to spot the the traders selling their own handmade wares, and even the stalls that are clearly reselling items have a selection of decent quality goods. Make sure you walk through both the inside area – where there’s some more permanent residents – and upstairs in the outside market. Camden Stables Market also has a very fine selection of food stalls – much better than the ones in Stables market, although those are more permanent. The range of cuisines is also incredible – Jamaican, Peruvian, Polish, Mexican are just some of the choices on offer – and with most meals costing around £5 or £6, I’d certainly come here to get a cheap fill of food on a day out in Camden, sitting by the canal. London Budget Tip! 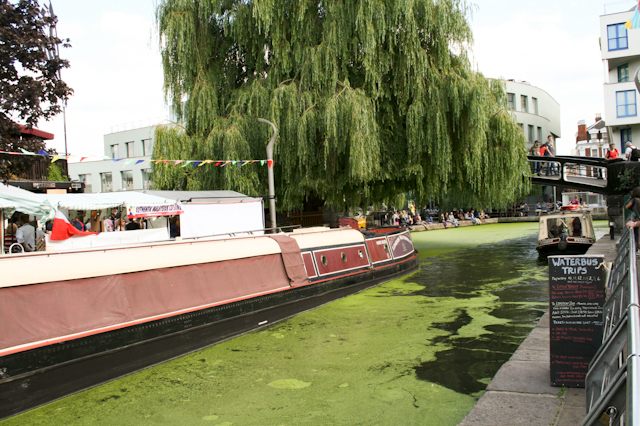 Regent’s Canal by Camden Lock Market – all green on the day I visited, due to algae! For a more sit down affair, Cafe Chula is certainly worth a look for tasty tacos and mouthwatering margaritas! (Nice alliteration, huh?) I’d should absolutely also point out that Camden Stables Market often hosts special events – for example, this summer they’ve held the night market each Thursday with stalls, food, an open-air cinema and more. 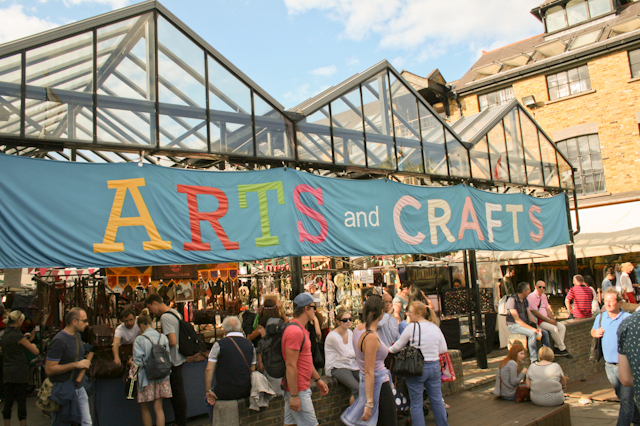 Across the way, you’ll find Camden Lock Village Market…which I’d say is worth a quick peek, but not much beyond that. I couldn’t really see anything of note amongst the wares on sale; there’s some amusing, moped-style seating by the food stalls at the market entrance, but that’s about the only thing that catches the eye. Further south, and you really start to get in amongst the mix of tack. There’s a truly ridiculous amount of souvenir crap, tattoo shops and piercing places – I’ve nothing against the latter two, although their number provoked me to raise an eyebrow. (That many people need tattooing?) You’ll be sure to see some of the small shops on the right-hand side with their rather amazing outdoor displays on the side of the buildings – now that, at least, is rather unique. Vintage clothing store Rokit is located here, and is certainly worth a look. If you’re into denim, plaid or old-school sports jerseys, then this’ll definitely float your boat. Joking aside, it’s certainly worth a look – you never know what you might find. Around the corner from Rokit you come to the small, pedestrianised Inverness Street. This place has another open-air market, although there’s a rather small number of stalls. Once again, I could see little of interest here, unfortunately; much better are some of the bars and restaurants on this street (Hache for burgers with quirky toppings; Made in Brasil for a pretty darn good happy hour; Simply Fish for good quality fish build-your-own fish meals). Opposite of Inverness Street is Camden Market. THE Camden Market? It shouldn’t be. This place, ladies and gentlemen, is the total pits. Just when you though the merchandise couldn’t get any more terrible, the tat any more…tatty?… it does. Even the actual surroundings are depressing. With a mix of fake music merchandise (One Direction t-shirts being all the rage), clothes of dubious style and thin cotton t-shirts and vests with funky “hand-printed” designs (when did this become such a fashion? ), I’m not sure what anyone would find that’s of any interest here. Just keep walking past. Don’t bother stopping in. Seriously. 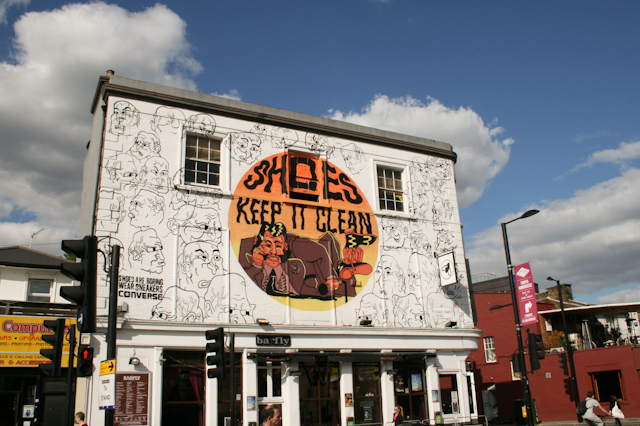 Down further to Camden Town tube and Camden starts to become a bit more high street-y. There’s the usual chains (Urban Outfitters, H&M) mixed in amongst other shops; it’s here that you’ll encounter the plethora of buskers performing, some good, most bad. It’s here that I encountered a man dressed in a Spiderman outfit…just standing around. So, turns out Spiderman spends his down time in Camden. Walk further south and you’re heading towards Mornington Crescent. There’s more shops or average quality if you head in that direction, but of note in one of the backstreets is a Brewdog bar serving up some very fine – and sometimes unusual – craft beer. Camden Lock Market For our pick of the best food stalls, with a blinding variety of cuisines! Proud Camden For partying it up in refurbished stables – just what you’ve always wanted, eh? 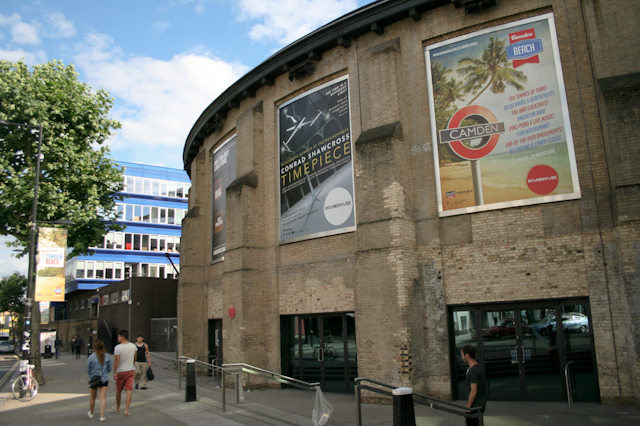 The Roundhouse For top quality gigs in an amazing venue – apply to get free tickets for the iTunes Festival (on in September) London Budget Tip!